The pound sterling depreciation since the June 2016 Brexit decision has increased the costs of commodities and food items for many British food producers and processors reliant on imports (more than 45% of food consumed in the United Kingdom is imported). While the pound sterling exchange rate has been less volatile in 2018 than in 2017, inflationary cost pressure for imported products has remained high. 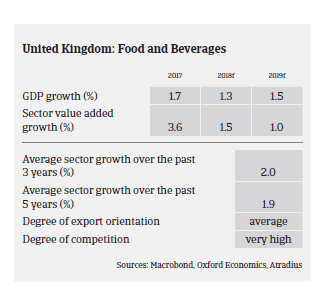 As a result, input costs for British food businesses remain high, while the chances to pass on price increases to retailers are limited. Further consolidation in the retail segment (especially among large retailers) and the increasing market success of discounters continue to weigh on suppliers along the food supply chain. The leverage against retailers is limited by the fact that the food producer/processing segment is dominated by small and medium-sized players in a highly fragmented market. 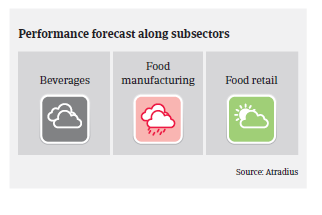 As a consequence the profit margins of food businesses deteriorated further in 2018, a development expected to continue in 2019. The trend to low margins and onerous or destabilising contracts remains commonplace in the sector, driven by a need to maintain customer relationships and/or production volumes as a means to cover overheads at the expense of profitability - which is not sustainable in the long-term. Therefore it comes as no surprise that producers and processors are increasingly pursuing mergers and acquisitions in order to increase their leverage in price negotiations (and product offering) with major retailers. Risk mitigation with forward contracts and currency hedging remains an important discipline for businesses. Undoubtedly, businesses that take forward positions will reduce some of the downside risks associated with pricing and Brexit in general. That said, due to the high share of SMEs in the food producing/processing segment many businesses lack resources and skills/expertise to manage these mechanisms effectively. Payments in the British food sector take between 45 and 60 days on average. Due to an inability to absorb higher input costs and increased pressure on margins, both payment delays and insolvencies have increased this year, remaining on a high level. We expect those increases to continue in the first half of 2019, at least. Some larger players continue to push the supply chain on price and longer payment terms, adding cash flow challenges to mainly smaller food businesses. 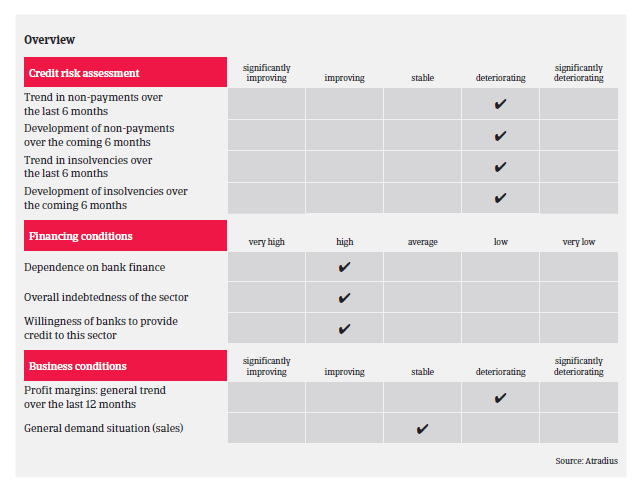 That said, despite the current difficult trading conditions across the sector, access to external financing (e.g. bank loans) remains reasonably stable. Asset backed lending facilities are extensively used in this sector. Due to the adverse developments, our underwriting stance has become more restrictive for the food industry in general. This accounts especially for the highly import dependent meat segment, where the weaker exchange rate has added pressure on already thin margins. This subsector is also heavily reliant on agency workers, the availability of which has reduced sharply. This has in turn pushed up labour costs. 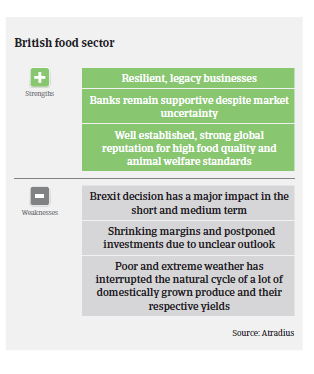 A hard Brexit scenario would pose a material threat to this subsector. We are also rather restrictive with the fruit/vegetables segments, as this subsector is highly dependent on imports too. The levels of both short firm fraud and impersonation fraud have remained stubbornly high in 2018, mainly in the meat and fruit/vegetables subsectors, and no improvement is expected in 2019. We are also more cautious with the dairy segment, where movement in farm gate prices and adverse weather conditions in 2018 have negatively impacted margins and further increased pressure across the supply chain. Fixed price contracts mean producers and processors are not necessarily able to recoup their margins. Due to reasonably good performance and robust export sales in some segments (e.g. liquors) our underwriting stance remains neutral for the beverages subsector, while we remain generally open for food retail. However, the increasing success of discounters is driving structural change within this segment, hence there is significant consolidation in the market. (e.g. Tesco’s merger with Booker and the potential merger between Asda and Sainsbury´s). We maintain frequent contact with companies within the sector allowing us to remain very close to developments in the industry and vigilant to changing dynamics and challenges throughout the food supply chain. The fact that we are in contact and receive management accounts of many food companies means that we are able to continue to write limits and maintain an acceptable risk appetite.